Hi. My name is Buddha Bunny. I'm the very handsome brown and white neutered boy. I have been told that I am an incredibly smart rabbit, which is true of course , but I am also a wonderful "hus-bun" to my bunny bride Sabra. 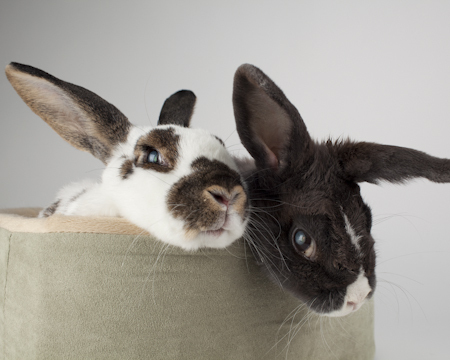 Both of us have been at SaveABunny as sanctuary rabbits for many years and are both at least 10-12 years old. I arrived at SaveABunny in 2000! Both of us are in our twilight years and Sabra is now blind, disabled and very likely to leave us soon. We both had sad starts in life and it took us a long time to learn to relax, trust and snuggle. SaveABunny founder, Marcy, used to take long naps with me on the sofa and I finally learned how wonderful it felt to be snuggled and kissed. Sabra is a gorgeous gray and white Dutch mix girl who was named after the fruit of a cactus, because she is very sweet despite a prickly and protective attitude. Many years ago, Sabra's human guardian died and left her in the care of relatives who did not know how to care for a rabbit. For months she lived alone outside in a wire pen among discarded broken dishes and garbage. She tried to find safety hiding in blackberry thickets, so no one could hurt her. Sometimes food and water was hard to come by. She lived alone and frightened without human contact for a long time. When Sabra was rescued by SaveABunny, her rescuer had to literally crawl over broken glass and through the thickets to get her. She made the scariest noises and fiercest poses she could make to protect herself and opened her mouth wide to show her teeth. Sabra and I are now a very bonded, old married bunny couple. You can almost always find us snuggled together or grooming each other. Now that we are both old and somewhat frail (we both have cataracts and Sabra has arthritis), we even prop each other up and lean on each other for support. Our lives started out sad, but now in our twilight years we are happy and contented. Marcy feels sad that she was never able to find us a forever home of our own. We didn't make it easy since both of us used to take great pride in scaring people away from us! However, Marcy loves us so much that she still wonders if there might be a very special place for us to live out the rest of our days where we can be spoiled and pampered as the only bunnies.